Chanteuse Country US née le 6 Juillet 1953 à Seguin (Texas). In 1986, Griffith finally got her big break after moving to Nashville, and a flurry of activity followed. The title song from Once in a Very Blue Moon fared modestly on the country charts, Last of the True Believers was released on the Philo label (which later reissued her first three albums as well) to noticeable acclaim, and -- most importantly -- Mattea's cover of "Love at the Five & Dime" reached number three on the country charts. Though Last of the True Believers was nominated for a Grammy Award as Best Contemporary Folk Recording, commercial country radio still found it difficult to accept Griffith. 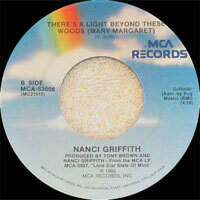 Griffith signed with MCA and released her major-label debut, Lone Star State of Mind, in 1987. With it, she popularized the Julie Gold song "From a Distance" -- later covered by Bette Midler -- and scored her first country Top 40 hit with the album's title track. Two additional singles, "Trouble in the Fields" and "Cold Hearts/Closed Minds," also grazed the country charts. Little Love Affairs and the live album One Fair Summer Evening (both released in 1988) were slight disappointments, though "I Knew Love" became Griffith's second country Top 40 hit. Disappointed by a lack of support from the country music scene, Griffith moved from Nashville to MCA's "pop" division in Los Angeles, where she partnered with noted rock producer Glyn Johns for 1989's Storms. The album included guest stars Phil Everly, Albert Lee, and former Eagles Bernie Leadon. Moreover, it became her best-selling work to date, though it featured no successful singles. A move from rock music to pop characterized 1991's Late Night Grande Hotel, whose transitional sound was aided by producers Rod Argent and Peter Van Hook. By this point, it had become clear that Griffith's move away from Nashville was also compromising her folk and country roots. A move to Elektra in 1992 marked a return to form for Griffith, whose 1993 LP Other Voices, Other Rooms was a tribute to her influences (several of whom -- including Emmylou Harris, Chet Atkins, and John Prine -- made appearances). A compilation of her best work from the MCA years also appeared in 1993. The following year, Griffith's tenth studio album, Flyer, continued her dedication to folk. In March of 1997, Griffith released Blue Roses From the Moons; Other Voices, Too (A Trip Back to Bountiful) followed a year later, trailed in 1999 by Dust Bowl Symphony. Griffith traveled the world over the next few years, flying to Cambodia and Vietnam in 2000 in order to retrace the steps of her ex-husband, Vietnam War vet Eric Taylor, and visited Angola and Kosovo the following year. After four years of travel and activist work for organizations like the Vietnam Veterans of America Foundation, Griffith released a new full-length, Clock Without Hands. A live album, Winter Marquee, followed in 2002, along with a dual-disc retrospective piece, The Complete MCA Studio Recordings. The following year was a landmark for Griffith, as she performed at the Grand Ole Opry for the very first time in 2003. With thoughts of war weighing heavy on her mind, however, she returned to the recording studio shortly thereafter to create Hearts in Mind, which was released the following year. 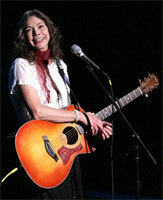 Ruby's Torch, a collection of sentimental torch songs penned by the likes of Tom Waits, arrived in 2006. While only two of Griffith's own songs appeared on the album, she wrote the bulk of the material for her follow-up effort, 2009's The Loving Kind. Griffith cut 2012's Intersection at her home studio in Nashville. 05/1986 SP PHILO 1096 (US) . Once In A Very Blue Moon / ? 07/1987 SP MCA MCA-53147 (US) . 11/1987 SP MCA MCA-53184 (US) . 03/1988 SP MCA MCA-53306 (US) . 07/1988 SP MCA MCA-53374 (US) . SP MCA MCA-53700 (US) . 11/1989 SP MCA MCA-53761 (US) .